Dharmendra Pradhan, Hon’ble Minister of State (I/C) for Petroleum and Natural Gas, visited Iran on 9-10 April 2016. He was accompanied by senior officials from his Ministry and also from Department of Petrochemicals, Department of Fertilizers, Department of Economic Affairs apart from CMDs/MDs from Central Public Sector Oil and Gas companies. Representatives of private sector companies involved in petroleum, petrochemicals and fertilizers sectors also travelled along with Mr. Pradhan as part of FICCI delegation. On 9th April, Mr. Pradhan had meetings with Minister of Petroleum Mr Bijan Namdar Zanganeh, Senior Advisor to the President of Iran on Free Trade Zones Mr Akbar Torkan and Governor of Iranian Central Bank Dr Valliolah Seif. During the meeting, the leaders noted that India-Iran bilateral relations have withstood the tests of time. Pradhan termed the lifting of sanction as an important milestone in Iranian history and said it represented a significant success for patient diplomacy and signalled a new chapter of peace and prosperity for Iran. The leaders agreed that it has opened up opportunities in our bilateral relations for new initiatives in the spheres of energy, investments and regional connectivity. Mr. Dharmendra Pradhan conveyed to the Iranian side that Indian companies could invest upto $20 billion and were interested in setting up petrochemical and fertilizer plants, including in the Chabahar SEZ, either through Joint Venture between Indian and Iranian public sector companies or with private sector partners. In this regard, he requested Iran to allocate appropriate and adequate land in the SEZ. He also requested Iranian side for favourable treatment in the pricing of gas for India and also supply of rich gas at competitive price and on long term basis for the life of the joint venture projects that Indian companies are interested in setting up. He said that competitive gas pricing was crucial in making the projects attractive for the prospective investors. He also expressed India’s interest in setting up a LNG plant and a gas cracker in the Chabahar port. 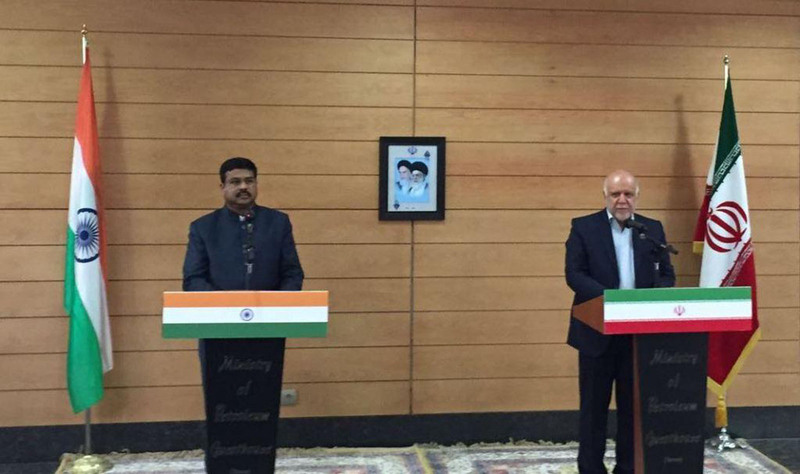 Dharmendra Pradhan also conveyed to the Iranian side that both countries must expand the basket of oil and gas trade. He expressed India’s interest in importing LPG from Iran and said that companies from both sides could discuss on setting up an extraction plant in Chabahar, if required. Both sides agreed to continue examining various means of evacuation of gas such as LNG, including through the proposed Iran-Pakistan-India pipeline. On 10th April, Mr. Pradhan and his delegation visited Chabahar Free Trade Zone and Port for a site visit and discussed the facilities and incentives which could be offered to Indian companies. Chit Fund Accused gives clean chit to Sanjay Dasburma!